ExoLens, which partnered with ZEISS for a pro line of iPhone lenses last year, will soon offer a protective case for the iPhone 7 to accommodate the lenses. If you feel cheated over Apple not rolling out new hardware at WWDC this week, legendary optics company ZEISS has a little something to ease the suffering of iPhone users who love photography. With the iPhone considered by many to be the world’s most popular camera, ZEISS brings its 170 years of lens design to mobile photography with wide-angle, telephoto and macro attachments for the iPhone 6s and 6s Plus. 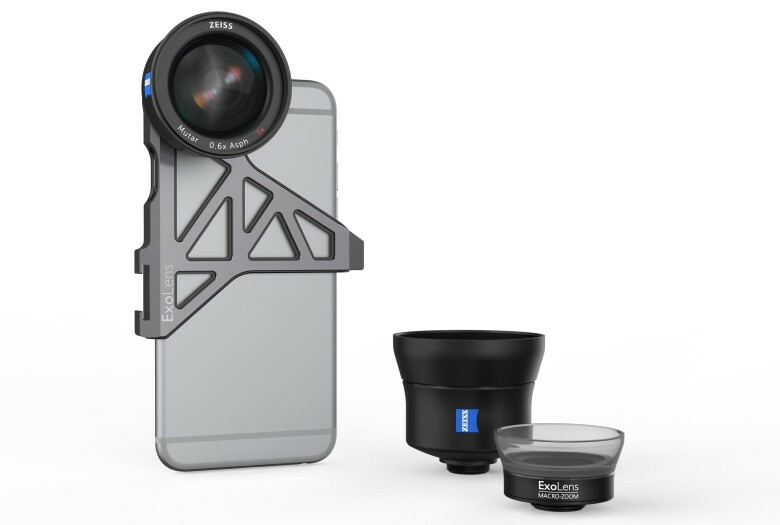 ZEISS partnered with accessory brand ExoLens and boasts the new mobile lenses will bring “gold-standard gear” to iPhone shooters. Apple Stores and apple.com this week will begin offering the ExoLens ZEISS wide-angle kit, which includes a machined aluminum mounting bracket for $199.95. Macro and telephoto lenses in the line will be available a la carte later this summer. One month after photo-sharing site Flickr announced the iPhone had become the most used camera among its 112 million members, ZEISS announced in January it would introduce pro-quality lenses, which could entice more sophisticated iPhone photographers. Most are satisfied with the native lens of the iPhone camera, but companies like Moment and Olloclip have been producing attachments to expand visual perspectives of serious mobile shooters. “The joint goal of ExoLens and ZEISS is to bring never before seen quality and versatility to the rapidly growing market of mobile photographers and videographers,” John E. Fellowes, CEO of Fellowes Brands, which owns ExoLens, said in a written statement. The ZEIIS iPhone lenses look similar to its popular Batis series for DSLR cameras and boast of having the same aspherical design, antireflective coating, and consistent sharpness and contrast edge to edge. The ZEISS Mutar wide-angle offers a field of view equivalent to an 18 mm lenses, which is ideal for landscape, architecture, or for videographers who want a wider shot. The Mutar telephoto will be similar to a 56 mm lens while the macro lens will have continuous focus adjustment function at a 40 to 80 mm equivalent.